I'm still writing 2012 on checks (yes, I still write the occasional check, often at the grocery store just to annoy the people people behind me in line). 01.) First things first, I'm rather proud of myself for getting three (shortish) weekday runs in (which was my goal). I mean, I know it's not that big of a deal, but since I'm known for not following through with things, I'm celebrating the small victories. I also did two CLX strength workouts, so that's good too. I'm planning on a slightly longer run (5-6 miles) tomorrow morning if it doesn't rain. I didn't realize I'd gotten so far off track over the holiday break, but I went from working out 5-6 days a week and eating fairly clean to 1-2 workouts a week (um, maybe) and eating all kinds of junk. I feel like I'm starting over. Almost. 02.) I've been thinking a lot about goals/changes/resolutions and what have you for this bright and shiny new year (I know I already told y'all this) and as of yet I have not written anything down (surprise!) but I am still stewing and brewing and mulling and culling. I do know I am craving some order in several areas of my life. I feel a purging coming on. I also know I'm craving simplicity and contentment, and call me crazy, but I think all three go hand in hand. I'm beyond sick of stuff, stuff, stuff, more, more more. Blech! Enough! So, um...yeah, I've got some work to do. 03.) Tuesday night Scott and Annelise got flu shots at Walgreens. Wednesday morning Annelise woke up with a low fever, so no school for her. I'd forgotten her tendency to run low fevers after vaccinations since it'd been a while and last year she had the flu spray instead of the shot. 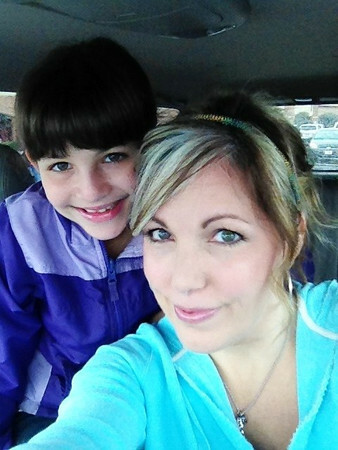 So she got to be my sidekick on some errands, like the bank and HEB, in the rain. 04.) Along with my as of yet unspecified goals, I am striving to be more intentional and productive with, well...everything, my time, resources, talents, choices, etcetera, etcetera...etceteRAH (said in my best Yul Brynner voice, side note: Annelise and I watched The King and I over the holidays and she couldn't believe I was crying when SPOILER ALERT... the King died. I can't help it, that movie gets me). So I've been cooking supper more this week, which I know is what normal people do every day but we'd slipped back into the habit of eating out or grabbing take-out all the time. Not that I'm planning on cooking every single day--no way--but at least a few times a week and we'll have leftovers and still eat out some. For some reason, I guess as part of being productive, I decided to bake my own bread yesterday. Actually, I baked some Wednesday but the yeast was dead so I was left with two pitiful pans of dough that never did anything, so I bought fresh yeast yesterday (two trips to HEB in two days, joy of joys) and tried again. It wasn't hard at all, thanks to my Kitchen Aid mixer and the miracle bread recipe (I made whole wheat) and made the house smell all delicious and homey. It also gave me a weird feeling of even if I do nothing else today, hey, I baked my own bread, so jump back Jack. 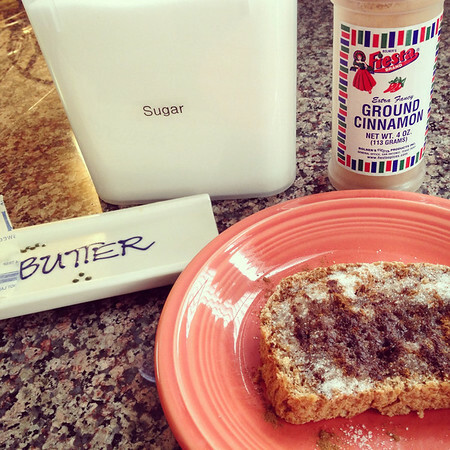 Annelise requested cinnamon sugar toast for a snack yesterday and declared she was in bread heaven. Love that. Although she did later admit she liked the store bought bread a little better because it was thinner and all the butter-sugar-cinnamon-y goodness can seep all the way through. Oh well. 05.) I've written about memorizing scripture before and have made several noble attempts these last few years to store more of God's word in my brain. 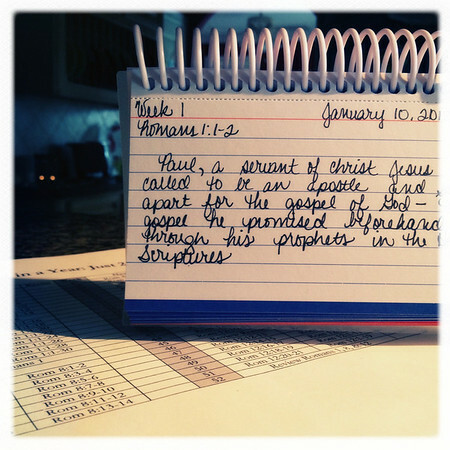 I've worked on memorizing two verses a month, which has been not only quite doable but highly beneficial, but honestly I've always fizzled out mid-way through the year. I decided to take on a new memory challenge for 2013, and yes, it's a doozy, but I think it's totes doable because it's broken down into bits and pieces across the whole year. I wimped out on memorizing Colossians a couple of years ago and skipped impressing the Sermon on the Mount firmly into my brain last year, but I am going to try to memorize three chapters of Romans this year*. Sometimes you just have to jump in. *Instead of printing out the cards or cutting and gluing the pages into a moleskin journal I decided to save on printer ink and just write the verses on ringed note cards. Writing also helps me learn the verse. I'm torn between feeling like time is flying by (it's already the 12th!!) and feeling like the school week at work was sooooo slow! Maybe I'm just still adjusting to being back at work after such a luxuriously lazy Christmas break. Way to go with the running! I need to do something to get moving. I stopped wearing my pedometer a few months ago so I'm not really making the effort to move as much. Thanks Jill! 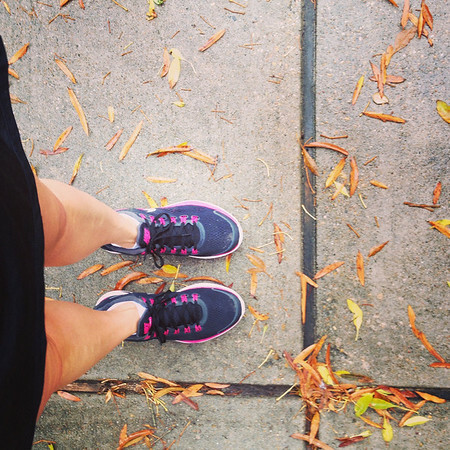 It feels great to be getting back out there--even though it'll take a while to build up my mileage again.